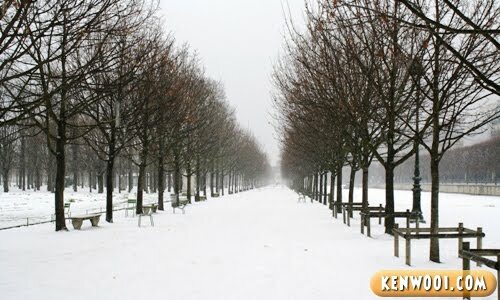 When I was on my trip to Europe back in December 2009, I knew I was bound to see snow – like finally! Hey, it was Winter season at that time! Woohoo! The first time I witness snow was on the 2nd day of my Paris trip. Woke up in the morning and snow was “raining” down from the sky! 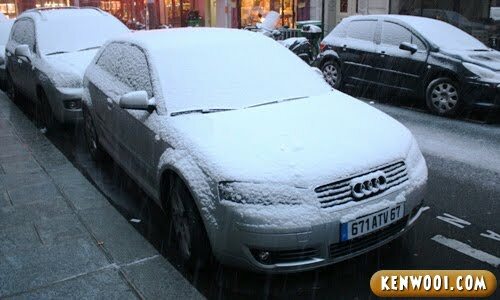 Just look at the car – it’s totally covered with snow! So cool! And I can’t resist myself from doing something cool as well! Yeah, engraving kenwooi.com on the rear windshield of a car! So, snow appeared on the day we were heading to Disneyland Paris. 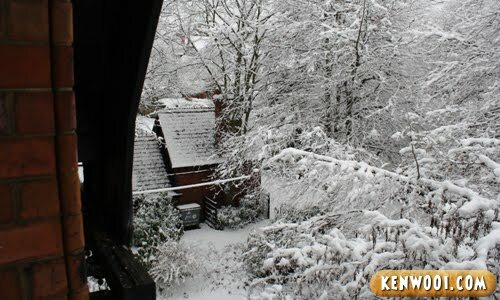 As we were taking the train to the destination, we saw all the buildings and structures were covered with white beautiful snow. Despite the heavy snow on that day, Disneyland wasn’t short of visitors. Everyone, especially the kids, were so excited and they got even more excited due to the snow. Even though my friends and I weren’t little kids anymore, I guess some of us are still a kid at heart. Just look at how excited Jonathan de Vinci is. We even made shapes of angels on the snowy floor. 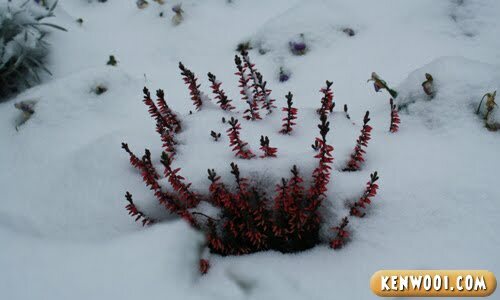 Some beautiful-looking plant still alive although covered with chilling cold snow. I guess the plants are already used to the weather. 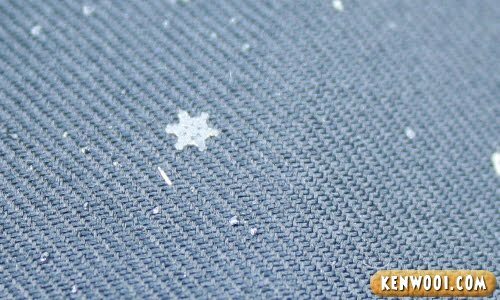 A real snowflake! However, it’s quite rare probably because it deformed before reaching the land. 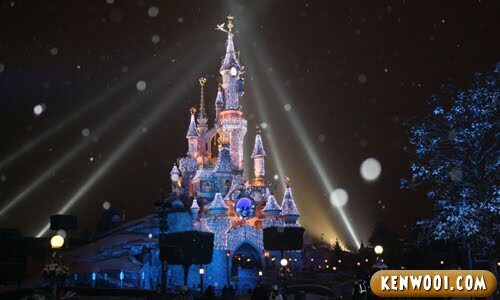 Anyway, being there at Disneyland with the presence of the snow was certainly something to remember. As the day started to darken, the snow became heavier. Too heavy that the 2nd Disney Parade was canceled. Oh well. Nevertheless, the day was undoubtedly filled with fun and enjoyment! Anyway, this was taken at the Jardin Des Tuileries garden right in front of Lourve Museum. Looks really amazing, somehow you wish to be there right? But when you’re really there – you’ll wish that the snow is gone! I’m serious! It can be pretty annoying at times. Back at home in Leeds, here’s the view of the snow right outside the window. To me, it’s really an amazing view. So white and pure. Even every branches were covered with thick snow. The road right outside the house. And also the neighbouring house. Just beautiful! While being in such a weather, it’s important to have proper thick clothing. But for the animals, the pigeons for instance, they don’t have cloths to wear. So they puffed their feathers. Making them look like fatty birdies! Cute right? 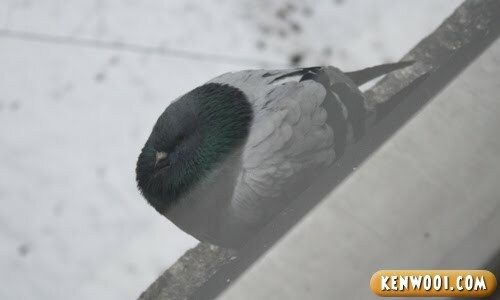 That pigeon was resting outside the window while the picture was taken. Also, with so much snow covering the surface of the ground and walkways, it’s even harder to walk without proper snow boots! Just look at the amount of ice I scooped from the ground. If ice-kacang entrepreneurs were to start their ice-kacang business here, I bet they can make the dessert anywhere, anytime! Oh yeah, some might wonder whether did I build a huge snowman or not – since there is plenty of snow to play with. To be honest, nope! 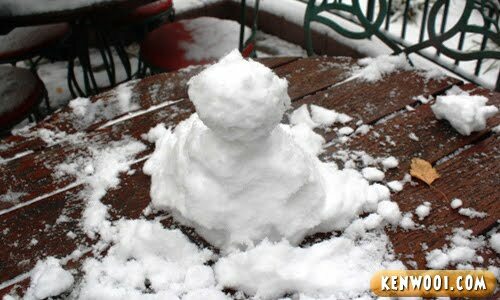 But a small tiny snowman on a table got lah. And since it’s so freezing cold outside, it’s like a open-air fridge over there. Going out and facing the cold isn’t always an interesting thing to do. Wow dude, you’re the real snow man! 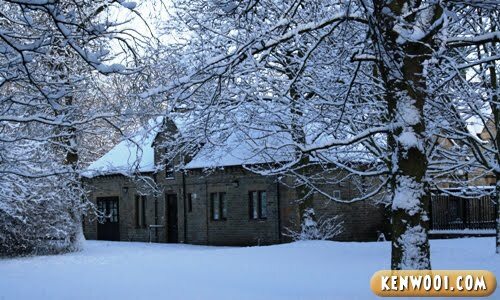 Nice photos of the snow! I also experienced snow in Malaysia – at Pavilion KL to be exact. But fake snow lah, haha! why didnt u make ice kacang with the snow anyway? hehe. 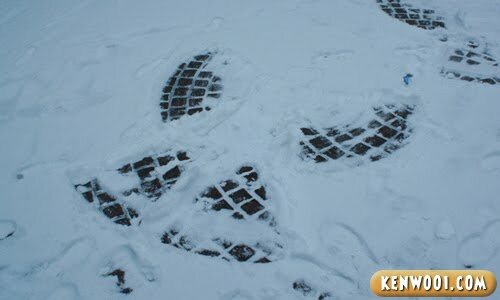 snow advertising is awesome. wow…i love the pure white snow !! Nice pics and thanks for sharing. snow is nice, but melting snow is dirty and messy. i am SO freaking glad that winter is over. I can finally say F.I.N.A.L.L.Y!!! If I’m not mistaken….you’re not supposed to held the ice with bare hand cause you can get frost bite which is why you feel pain….be careful, your cell might damaged. wow..that is a great time u have there. omg! you caught a snowflake!!! One day, I wish I could see and experience snow on my own. I love Disneyland…but didn’t think much of snow. Looks nice in pictures…only. LOL!!! I’m gonna enjoy the snow end of this year !!! wow paris!!! bila la bole pegang the real snow.. I haven had the chance to see snow.. the closest I get is when I was climbing to the peak of mount kinabalu – the tour guide told us it was snow.. but just one chunk here and there..
Soooo lucky…. how does it feels like – the snow? 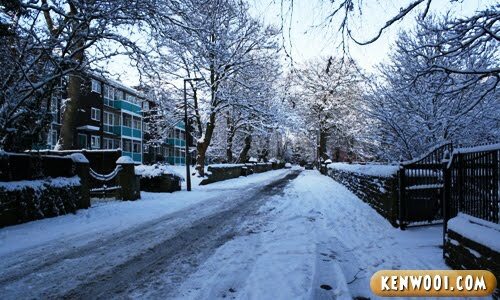 is it like touching ice cream or fluffy like a cotton candy..
How I “miss miss” the “snow” back then when I was in UK with my hubby…really love it! 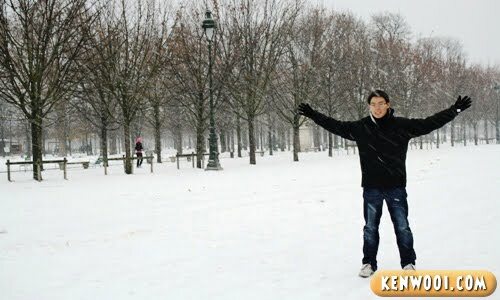 wah..nice pic..i really like winter..
wahhh bestnyer dapat main salji….. The snow flakes was notice by a 10yrs old boy name Duwayne Joshau Khoo and he did the snow angle also. Thanks Ken, the 2 kids already complain that your story they r not in it. They were sad, Don’t know when we can have this fun all together again. So nice! I luv all the pixs. Green smile! 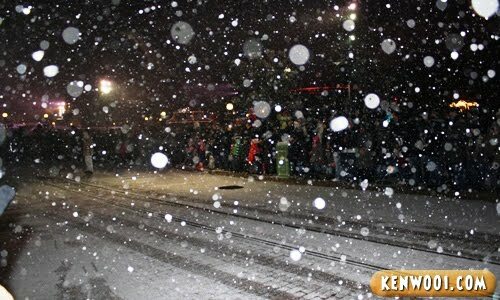 I really want to touch REAL snow..
hmmm…de last time i saw snow flakes were at Curve..hhahaha..
wish i can be there one day..
i wanna go to disneyland.. T.T never went overseas before. Ken~~~ You are so evil. It so Bl000000oooddy hot here and u post your photos, all snowly cold and ARGhhh~!!! wonder when will that be. i want to see snow too!!! 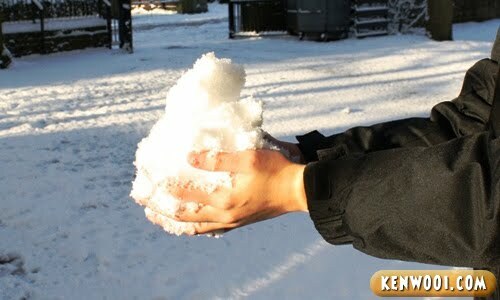 Nice to play in the snow……snow ball fight…he he he! Beautiful shots, Ken. I can imagine how cold it must have been. I remember how cold it was on the ski slopes in New Zealand, even with the sun shining. Thanks for sharing. OMG!! i am so jealous!!!!! and very excited to be like you..
kenwooi….u memang suka travel meh? The engraving idea was so cool! nice! i want to play with snow too!!! awesome pics! the closest we have here is the genting snow house, lol. wow I wanna go Paris/ snowing country too! tat guy is real cool!! i love snow! 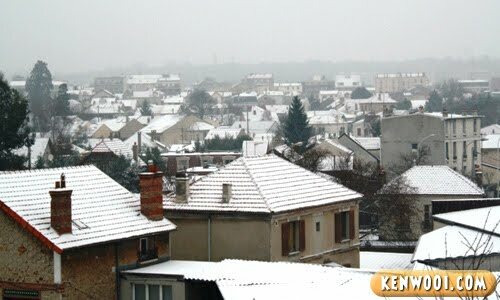 let it snow, let it snow!~~~ :) envy! Cool pics (pun unintended)! I like the one where u wrote your blog url on the car rear windshield. Haha. Did you really write that or was it a photoshop job? Wow! So nice playing in the snow! Is it very cold? How cold arrr??? -40C?? BTW have u pee out in the snow? According to my friend who work in Russia…….if u pee out in the snow ur didi will be frozen in no time!!! Oh, I wanna go there one day!!! hahaa.. Ken, u did it again!! I love your posts.. they r getting more and more interesting… move aside kennysia… kenwooi is anytime better! 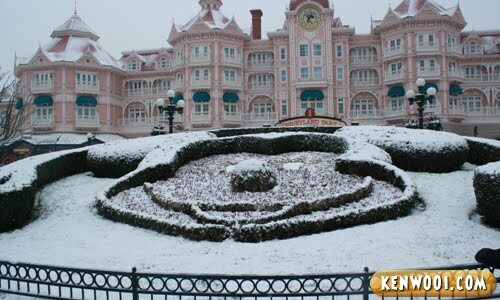 when i went to japan in dec, there was no snow.. so disappointed.. i havent experienced snow before.. didnt know paris got disneyland.. ding know the snow is shaped like a star too.. hey, are u pulling our legs? hehehe..
Nice snowy pictures u have!! love snow-a-falling; mebbe coz we dun get it here in msia. wondering if the car owner checked our ur blog…. heh.. Guess Im a bit late here XP Nice photos~ I love the snowflake~! wah…. dreamed honeymoon place! hahaha. waaah, it’s always been my dream to go to Paris. 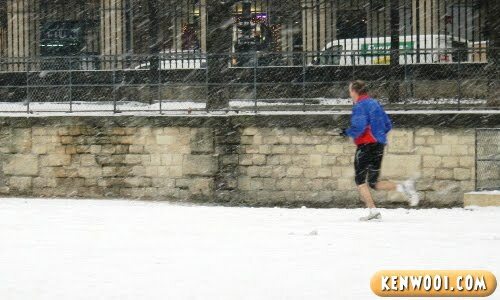 Jogging during the winter, awesome i tell you! Oh babe, how I miss Paris. Was there when I was ….21yo. Now just looking through blog..Sad isnt it. So this is what you meant! Haha! Aww so I only went to Cinderella’s castle in Tokyo :( I’d LOVE to go to Aurora’s (sleeping beauty, incase people aren’t familiar hehe) but it looks weird though… And I didn’t know we could go inside!!! GAHHH!! Awww.. Snow. I MISS SNOW SO MUCH!!! My first time was in Canada and I went to Toronto and it was -30degrees so it’s damn crazy but I only had a thermal jacket on coz I swear it wasn’t cold. LOL. I think my husband must have gotten a shock every day that I refuse to put on the winter jacket. Cheeeeers! Moving on to the next Paris entry. nice!! i realy want to paly wif snow..